Fleece (sweatshirt fleece, polar fleece, etc.) is a favorite fabric for making homemade hammocks but you can also experiment with different materials to be used for different purposes. Fleece and flannel make cozy beds for winter time and cotton and denim make nice beds for warmer weather but no matter what fabric is used, watch for loose threads and discard the hammock if it is being chewed up. Owners usually have to discard a few store-bought hammocks due to chewing but the swivel clips they come with can be saved to make your own hammock. You can also buy a variety of clips, snap hooks, carabiners, shower curtain hooks and other assorted hardware or jewelry making supplies that can be used to attach hammocks to cages. Check your local craft, hardware or animal supply store for different options. Whichever option you choose, try to think about it in terms of safety making sure no toenails, feet, heads or other body parts could get trapped in the clips you choose. Bits of fabric, sturdy ribbons, bias tape or nylon webbing (like leash material) can be used for making the loops to which the hanging clips are attached. Thin leashes bought at discount stores can be cut into smaller sections as inexpensive webbing for the hanging loops. This hammock can be made into any size you like. For the hammock demonstrated here, two pieces of fleece are cut into 12 inches by 24 inches. The finished hammock is just nine inches wide by 10 inches long (suitable for a rat or smaller pet; a larger one would be necessary for rats to pile in together, or for a ferret). To make a differently sized hammock here is a general guide to sizing your pieces (the exact size of the finished product will depend on seam allowances and may also be affected a bit by the thickness of your fabric). Decide how big you want your hammock then cut two pieces of the fabric. The width of the hammock should have two inches added on for seam allowances and the length should be doubled what you want the final length to be. You will also need to cut four strips of your chosen material for hanging loops. These can be cut to any length you wish and then doubled over to make a loop so the finished length of the loop will be less than half of the cut length (nine inches is a good starting point to cut the strips ​into). Place the two pieces of fabric together with the right sides together (so it appears as though it is inside out). Leaving a small opening that will allow you to turn the hammock right side out, sew around the rest of the rectangle leaving about a half an inch seam allowance. Snip extra fabric from the corners outside the row of stitching as shown in the bottom left-hand corner of the photo to make turning the corners right side out easier. Turn the pet hammock right side out through the opening then hand stitch the opening closed as the bottom right-hand corner of the photo shows. Lay the right-hand stitched together (and right sides out) hammock on your work surface. If you have two different colors or patterns, the side facing up will eventually become the outside of the finished hammock. Feed the strips for the hanging loops through your clips. Lay the hanging loops on the hammock as shown in the photo (the loops and clips should be towards the inside while the loose ends are hanging over the edge of the hammock). The hammock should be roughly divided into thirds in your mind if the loops are positioned correctly but don't worry about their exact placement (you can fiddle with the placement of the hanging loops later on). Fold one side of the hammock over one set of hanging loops. Fold the second side over the second set of hanging loops so that the folded in parts overlap a bit. 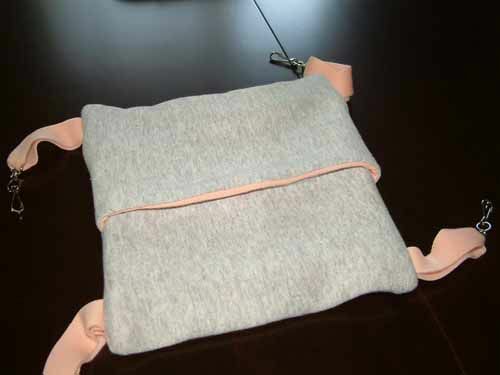 Tip: A one to two-inch overlap (as shown in the photo) will make an "easy access" pouch while a greater overlap will make a more enclosed pouch. Stitch along both sides of the hammock (shown by the yellow line), across the folds. For a little added strength, back stitch well at each end and over the hanging loops. Grasp the opening of the pouch to open the hammock and turn the whole thing right side out. Tip: For pets that don't do hammocks but like sleeping pouches (like hedgehogs and guinea pigs or even rats and ferrets that prefer solid ground), you could simply skip the hanging loops and make a pouch that sits on the ground.